The purpose of lab exercises in this week is to identify valid Internet Protocol (IP) addresses, subnet masks, the components and structure of IPv6, and configure IP host addresses. Configure the TCP/IP settings on a new computer by using Network Connections, using the IP address, the subnet mask, and the default gateway provided. Configure a new computer for a static IP address, the default gateway, and a DNS server. Complete Simulation Exercises 5.1.2 and 5.1.3. Were you able to configure IP addressing using Windows operating system?Were you able to identify valid IP addresses and subnet masks? Were you able to identify the components and structure of IP addresses, IPv4, IPv6, and required setting for connections across the Internet? The purpose of this lab exercise is to identify network services and protocols such as Domain Name Services (DNS), Network Address Translation (NAT), and Windows Internet Name Services (WINS). Configure the TCP/IP protocol for a Windows XP Professional computer to use specific DNS server addresses. Configure the TCP/IP protocol for a Windows XP Professional computer to use specific WINS server addresses. Configure the TCP/IP protocol for a Windows XP Professional computer to use Dynamic Host Configuration Protocols (DHCP) with DNS server information. You are configuring network connections for a Windows XP Professional computer. Currently, your network uses manual IP addressing. Previously, your network did not use a DNS server, but three DNS servers have recently been installed. Note: When you configure the TCP/IP properties, you can only set two DNS server addresses. To configure additional DNS server addresses, click the Advanced button. On the DNS tab, use the Add button to configure additional DNS server addresses. You are configuring network connections for a Windows XP Professional computer. Currently, your network does not have a DHCP server. Your network has both Windows 98 and Windows XP computers. The network has two WINS servers. Note: To configure the WINS server addresses, edit the TCP/IP properties as if you were configuring the IP address. Click the Advanced button and set the WINS server addresses on the WINS tab. Configure a DHCP server connection for a local host. 4.6 Given a scenario, determine the impact of modifying, adding or removing network services (For example: DHCP (Dynamic Host Configuration Protocol), DNS (Domain Name Service) and WINS (Windows Internet Name Service)) for network resources and users. You are configuring network connections for a Windows Server 2003 computer. Previously, your network did not have a DHCP server, but you have just installed and configured one. Your task in this simulation is to configure the TCP/IP protocol for the Local Area Connection network connection to get IP addressing and DNS server information from the DHCP server. Configure Internet connection sharing (ICS). 2.8 Identify the differences between private and public network addressing schemes. 2.13 Identify the purpose of network services and protocols (For example: DNS (Domain Name Service), NAT (Network Address Translation), ICS (Internet Connection Sharing), WINS (Windows Internet Name Service), SNMP (Simple Network Management Protocol), NFS (Network File System), Zeroconf (Zero configuration), SMB (Server Message Block), AFP (Apple File Protocol), LPD (Line Printer Daemon) and Samba). You are configuring Internet connectivity for a small office network. 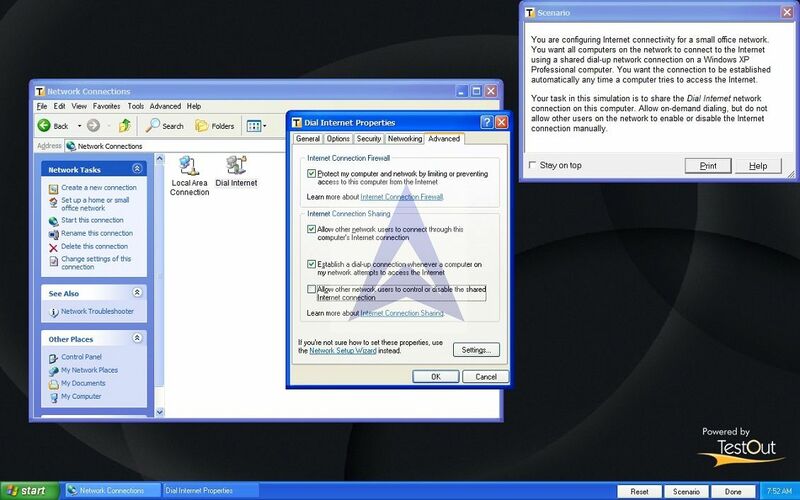 You want all computers on the network to connect to the Internet using a shared dial-up network connection on a Windows XP Professional computer. You want the connection to be established automatically any time a computer tries to access the Internet. Your task in this simulation is to share the Dial Internet network connection on this computer. Allow on-demand dialing, but do not allow other users on the network to enable or disable the Internet connection manually. Were you able to configure the TCP/IP protocol for a Windows XP Professional computer to use the given DNS server addresses by showing the appropriate changes in the configuration? Were you able to configure TCP/IP protocol for a Windows XP Professional computer to use WINS server addresses by showing appropriate changes in the configuration? Were you able to configure TCP/IP protocol for a Windows XP Professional computer to use DHCP using DNS server information by showing appropriate changes in the configuration?